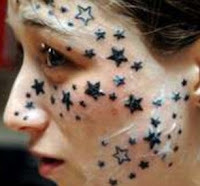 I read this news of a Russian girl with 54 stars tattooed on her face; thank god I have it on my arms. But mine are not ordinary arms that could be hidden under the sleeves of my shirts; mine are a teacher’s arms that are meant to lead. I still feel the pricking pleasure of the needle pecking my skin ten years ago, the joy of having it done, and the pride of showing it off. Then I didn’t know my future. Life had this respectable future set aside in a surprise box and didn’t even give me a clue of what I deserved to be. Three years as teacher now, I can no more hide my arm from the thousand curious eyes. My childhood pleasure has taken a sharp turn-It has given me a forbidden arms. My wife always insists that I should wear a full sleeve shirt or a jacket while we have guest or while going out. She justifies that she does not want people to get an impression of me just by my tattooed arms. Irritated, sometimes I cry out to her, “I don’t care what people think of me .Those who know me don’t care about the tattoo”. But at back of my mind I realize that it matters. Bhutan is still innocent and tattoo still contradicts it culture. When I look at my left arm filled with tattoo I laugh at how stupid I had been. As a young boy being naughty is unavoidable, which as we grow time forgives .But what have I done? Even time is helpless. Had I written on a stone “I am Naughty” I could have sand it off but I have done it on my skins, to last so long as I live. The Russian girl has sued the tattooist for £10,000. Whom shall I sue? My stupidity? My childhood? I am undergoing a non-bail-able sentence of my own trial. There exists some laser technology to remove tattoo in developed countries which is but too far and too expensive. The Russian girl will have to pay $10,000 to undergo the surgery, which is equivalent to my seven years’ salary. My students stare at my arms in sheer curiosity and pleasure. I can’t hide it completely from them. They are not disgusted by my tattoo and that gives me added fear. Students learn from what a teacher does far more than what he says. I am afraid I may have to go on paying higher price for a silly boyhood pleasure. My schooldays friends loved my tattoo, they would ask me to do for them too. I had tattooed so many of them. They were happy and would take me on lavish treats. Time has changed me and so must my friends, they must hate me now, but I know I am paying the heaviest price. I am a teacher. My friends here pass different comments on different days on the same tattoo and I have nothing to defend myself but some word of apology. The same apology goes to everybody who would ever see me with my tattoo. Thanks Bhutantimes, Big B in particular for placing this article on page 12 of today's issue under Interlude. I hope this goes out to change the mindset of many a young Bhutanese minds. There is nothing cool about tattoo. and the horse shoe, whats it for? and the rest??? Sure our generation will have a great no. of Grandpas with tattoos. Right penLord as in lord of the ring... childhood fantasy. 6.6.83 my birthday with a dead note in case i died in a jungle lol, and a snake which turned out like an earthworm. When we turn grandparents we will tolerate tattoos... then my articles will be laughed at.